I have been photographing weddings here in the Cancun and the Riviera Maya for about 7 years now and I have to say, I am no longer a fan of boutonnieres. I understand that they are traditional and some boutonnieres are incredibly cool/beautiful, but after photographing over 500 weddings here and seeing so many problems with them, I’m not longer a fan. Here are my Top 3 reasons I do not like Boutonnieres. Boutonnieres are designed to go on jackets and a lot of times the groom is wearing a jacket, but with 80% of groomsmen wearing only a shirt to the wedding, they get placed on a shirt in the majority of my weddings. And there is a 90% chance the boutonniere will make an unsightly hole in the shirt. And let’s face it, it might not totally ruin the shirt, but it will have a weird hole in it near the pocket. 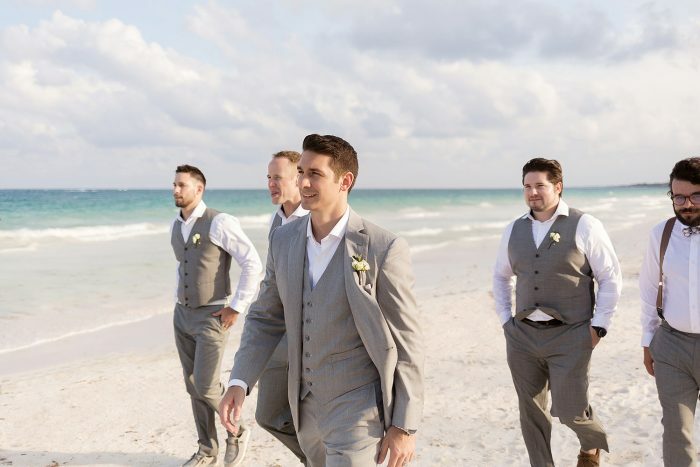 Therefore I suggest if the groom is wearing a jacket and the rest of the guys are wearing shirts, don’t worry about a boutonniere for the rest of the guys and just get one really awesome one for the groom. 2) It will not sit properly. I can’t tell you how many times I am continually asking the groom and/or groomsmen to adjust the boutonniere so that it is sitting properly. And as a photographer that loves authentic natural moments, it can be challenging to keep everyone in the moment when there is a flower flipping upside down on his shirt. Now if the groom is wearing a jacket, then there is a 90% chance the boutonniere will sit properly and you will not have a problem. This only happens when it is placed directly onto a shirt. Boutonniere’s die rather quickly under any conditions, but here where the temperature is often 33+C (90+F), they do not last long at all. As a result, I end up Photoshoping a lot of them out at the request of the client as no flower is better than a dead one. And again, if you are wearing a jacket and/or vest (waistcoat) and have a place for a boutonniere, then please wear one and when it starts to die we can remove it, but please have reasonable expectations for the little flower. What to do if you really want to wear a boutonniere on a shirt? If you really want to wear a boutonniere at your wedding (or your really want your man to wear one) AND he is only wearing a shirt, then please to try to get one that is very light. The lighter the better as the shirt alone is seldom enough to hold one in place. Finally, I want to mention something that happens at nearly every wedding. Inerrability the boutonniere’s are delivered to the guy’s room, they try them on and realize that not only it is ruining the shirt, but also that they are not sitting properly. And every single time, the guys think of the bride and think this is something she wanted so let’s do it guys. This desire to make the brides wedding day special is a common theme I see in nearly every wedding and I love it. 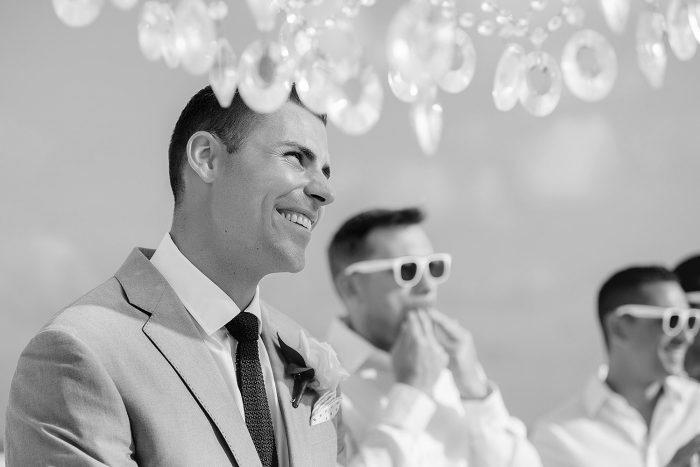 It’s awesome to see guys wanting to make one person’s day special, but I also can’t tell you how many times after the bride saw that the free boutonnieres from the resort were not sitting properly she wanted them removed. So if you are a bride reading this, please talk to your man so he knows what to do. I hope you found this helpful and if you have any questions or comments please feel free to contact us.